Lock axis scales - The fluorescence laboratory. Normally, the graph window of a|e is automatically updated when a new spectrum is selected in one of the data listboxes. This also resets the axis scales (the minimum and maximum limits). The axis scales, however, can be locked at a certain interval so that they do not change when selecting another spectrum. 1. 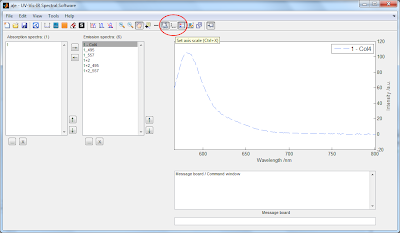 Press Ctrl+X or click the 'Set axis scales' icon in the toolbar. 2. In the dialog, tick the 'Lock at this scale' checkbox. 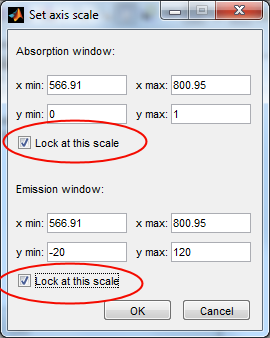 There is one checkbox for the absorption window and one checkbox for the emission window. 3. 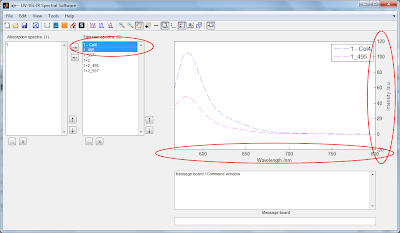 Press OK. Now, when selecting a new spectrum in the data listbox the axes are not re-scaled to fit the new spectrum.